Forming soft curves and razor sharp edges, the orange dunes of the Sossusvlei in the Namibian desert are timeless. 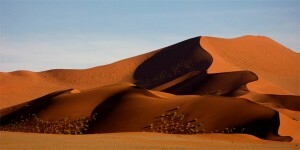 Commonly referred to as the highest dunes in the world these stunning dunes are not something you want to miss out on. In addition, the Sossusvlei are often said to be one of the most magnificent sights in all of Namibia as the sunrises and sunsets offer outstanding photographic opportunities with their ever-changing strong and vibrant colors. The stillness of the desert brings a deafening silence allowing visitors to witness the quiet desert solitude. 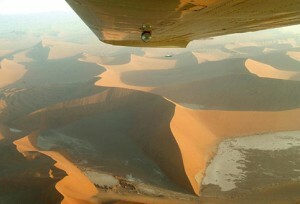 Sossusvlei offers a number of unique attributes for tourists to see such as Elim Dune, Big Daddy, Deadvlei, Dune 45, and numerous petrified dunes. The Elim Dune is a rather isolated dune located close to the Sesriem gate while Dune 45 promises to be “the most photographed dune in the world” due to its interesting shape and unusually simple features. Big Daddy is the highest dune of the lot, measuring 325 meters and faces another high dune known as “Big Mama”. Deadvlei is a dried up oasis that used to host a number of acacia trees, but the river changed its course emptying out its water supply and leaving behind blackened, dead acacia trees. Another captivating feature is the heavy mist that sweeps in over the desert, enabling it to give life to many plant and animal species. The cold air blown in off the Benguela Current combines with the hot desert air to create an environment in which certain types of plant and animal life can survive. The most unusual plant species is the Welwitschia mirabilis, which can live for over 1,000 years. Other animals such as springbok, gemsbok, the desert elephant, ostrich, jackal and brown hyena, are attracted to the desert’s fresh water springs which create rare oases in the desert. Tourists can choose from guided hikes, 4X4 driving tours, hot air balloon tours, or scenic flights in a light aircraft. This area is magical and not to be missed on a journey to Namibia. Check out our recommendations for where to stay in and around Sossusvlei.